Not sure where to start? Check out our sample menus for some inspiration. You can mix and match, these are just ideas! We'll personalize any menu for your event. 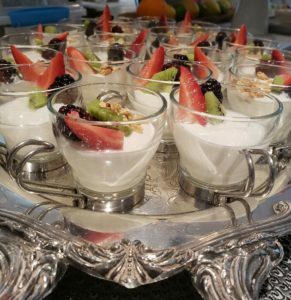 Mix & match to create the menu for your event, these are just some delicious ides from omelette stations to waffles and yogurt parfaits! Gluten free options available, just ask. Hot or cold, buffet style or sit down, find menu starters for your upcoming luncheon. Annemarie will customize a menu just for you and can accommodate even the pickiest eaters. From the simple cocktail party to a formal sit down dinner, you'll find inspiration for your next dining event with these example menus. Kids menus also available.